Another being has invaded Bognor Regis and Chichester city centres from the Dark Side. 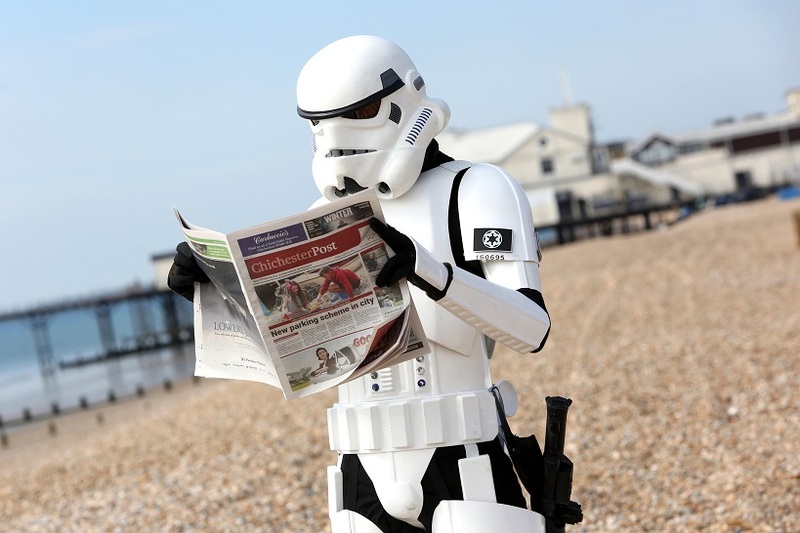 Residents and visitors have been seen posing with a Stormtrooper around the Post areas for a few weeks. The robot soldier has been parading around greeting people with high fives, hugs and friendly waves. Real name, Grant Warren Gibson, aged 23, from Bognor Regis, is enjoying his anonymous rock-star fame and says he does it simply to make people smile. Working full-time job as a carer, Grant uses his time off to cheer people up. He said: “I’ve been a Stormtrooper walking around for about five months now. I go round Bognor Regis, Pagham, Chichester and Fareham and just wave at people. Grant got his suit – it is made from fibreglass and cost around £700 – in Great Yarmouth and he put it together himself. He even got a blaster rifle 3D printed. A Stormtrooper is a fictional soldier in the Star Wars franchise, they are the main ground force of the Galactic Empire, under the leadership of Emperor Palpatine and his commanders, most notably Darth Vader. Grant is known among his fellow Stormtroopers as Goldie because of the gold lenses in his helmet and his badge number 160695 – 1606 is his rank number and 95 because of his birth year.